There is so much to see and do in Australia, from the fun attractions and activities, to whether you spend the day at one our world famous theme parks, or visit our Top Attractions, or spend the day just relaxing on one of our beaches, Australia has something for everyone. 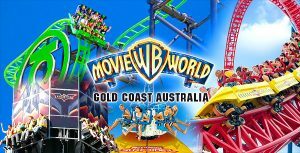 Warner Bros. Movie World is a popular movie related theme park on the Gold Coast, Queensland, Australia. Splash into another world, with some of the biggest and most extreme water slides in Australia. Wet‘n‘Wild is not to be missed. Make friends with our amazing marine life, from dolphins to sharks, seals and more. The Australian Reptile Park is the best family FUN day out! Exciting wildlife shows, loads of animal interaction and great customer service is what we are famous for! The Sydney Harbour Bridge is one of Australia’s most well known and photographed landmarks. It is the world’s largest (but not the longest) steel arch bridge with the top of the bridge standing 134 metres above the harbour. It is fondly known by the locals as the ‘Coat hanger’ because of its arch-based design.